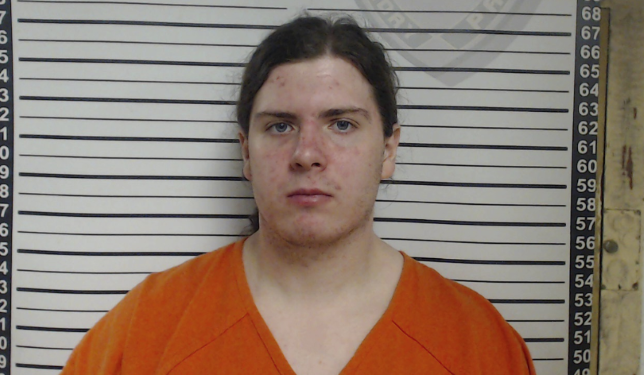 OPELOUSAS - The son of a sheriff's deputy is in custody after a series of fires that destroyed churches with predominantly African-American congregations in recent weeks. Officials announced 21-year-old Holden Matthews was arrested on three counts of simple arson Wednesday. Matthews is the son of a St. Landry Parish deputy, Sheriff Bobby Guidroz said. The sheriff said Matthews' father was shocked to learn of the allegations against his son. According to fire investigators, Matthews is suspected of lighting the blazes that destroyed the 140-year-old Mount Pleasant Baptist Church and two other churches in the St. Landry Parish area. He is not believed to be connected to a fourth church fire in Caddo Parish during the same time frame. The first fire occurred March 26 at the St. Mary Baptist Church in Port Barre, and the second happened April 2 when the Greater Union Baptist Church in Opelousas caught fire. On Arpil 4, the Mount Pleasant Baptist Church in Opelousas also burned down. Arrest records say the remnants of a red, Scepter-branded gas can were the first major clue investigators found leading them to Matthews. After determining Walmart was one of the few sellers of that two-gallon can in the area, detectives eventually found that Matthews purchased one such gas can, a pack of shop towels and a lighter at Walmart just a couple hours before the fire at St. Mary Baptist. Surveillance video also captured Matthews leave the store in a pick-up truck similar to the one spotted outside the churches around the time of each fire. That truck was later discovered to be registered in his father's name. Browning said Matthews' motive in the fires is still unclear, but information uncovered by investigators and offered by Matthews suggests a connection to "black metal" music. The fire marshal said the genre has a history associated with church burnings. Black metal music is a genre of music that is anti-Christian and satanic. It was linked to church burnings in Norway in the early 90's. Thursday, retired LSU Music Professor Bill Grimes said that type of music requires little talent, and he doesn't think it will be around for a while. "This is not going to be music that is studied listened to or performed in 100 years the way our great masters are," Grimes said. "This is a fleeting thing." Mental health experts believe people who listen to that type of music could be affected over time. "It's paganistic and satanic heavy metal music with a lot of shrieking, high pitched sounds for long periods of time," Steve Aguillard with the Capital Area Human Services District said. "Anyone who listens to that for a long time it will affect neurologically what's going on, almost a brain washing type of manner." A statement from the fire marshal's office said any "potential motivations of hate" in the fires are still being investigated by federal authorities.